My 1GB SD card is now 460MB, now what? I have an ATP brand 1GB SD card that's been working fine until today. The partition got corrupted when I unplugged it without doing the "safely eject hardware" option. Windows complained the media isn't formatted and asked if I'd like to format it, but the camera was able to read it, so I was able to salvage the pictures by using the camera cable. Data recovery software was recognizing the existing partition as being 480MB and the card being 960ish MB. 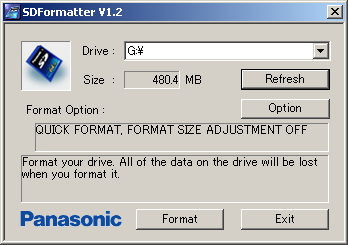 After I got all my data, I put the card into my card reader and use the Panasonic SD formatter. At this point, the "capacity" field showed 960 ish, but after I clicked "format" with the option set to "quick", it instantly flashed over to "460MB" and the card is now permanently 480MB. I probably should have clicked "full format", but who would've guessed permanent damage! Somehow the SD Formatter altered the descriptor header on my card, so no matter what I do, the card is recognized as 480.4MB. In my Panasonic camera = no success. Administaritve tool in win xp = it won't let me create/delete partition on removeable media. The card functions just fine as a 480MB card, so I think its something the SD formatter utility wrote to it in the user inaccessible section of the card. You may need to go beyond the usual flash memory card utilities to disk formatting softwares. eg. Norton PartitionMagic. These more advance programs allows you to remove previous partitions and start from scratch. I do not have that software, but I tried PartitionMagic. It won't even acknowledge any removeable medias. Here it goes for warranty replacement to ATP, but I'd sure like to know a way to fix it myself. Yes I tried my PartitionMagic as well - and it won't recognize any flash memory cards through the card reader. Sorry my mistake, this didn't help you. I corrupted a card a while back that I couldn't get fixed with any tool I tried... that is, until I tried the Windows XP admin tool. I had been using the card to transfer data between dissimilar operating systems (Windows and Linux) when the problem occured. The Windows Disk Admin format corrected what appeared to be a problem with the partition, even though other utilities I tried wouldn't (I did not try to alter the partition, only format the card). It would not format using Windows Explorer (where you right click on drive and select format option). But, the Admin tool handled it. It's also possible it's a compatibility issue with your reader. I can remember some cameras and readers having problems with cards over 512MB in size at one point. If you want to try removing and recreating the partition, you may be able to do it with Linux. Most Linux distributions include a partitioning tool. Typically, either GParted or QTParted is on them. Both are relatively easy to use with GUI interfaces. Thanks, but I ended up sending it back to ATP for a warranty replacement.